Great way to start out Summer Quarter and you would not miss any classes that start in Summer Quarter! Poster, Program Description and Itinerary attached. Audience: Students in the UW College of Built Environments (CBE), Canadian Studies, other departments in the university and departments at UW Tacoma and UW Bothell. Course Description: Comparative research in urban studies has been a major development in the last decade but little has been done to provide US students with a comprehensive knowledge of Québec cities and how they compare with US cities. The aim of the course is to introduce students to theoretical and methodological aspects of comparative urban research by providing on-site case studies of Québec cities. The estimated cost of the trip for each student, including airfare, meals, lodging and ground transportation is $1,500. The course is open to Juniors and Seniors, as well as Graduate students, for three to six hours credits. We will visit three Quebec cities – Montréal, Québec City and Ottawa, where a number of professors, government officials and other urban experts will give lectures and tours. The course will examine similarities and differences between U.S. and Québec cities. We will look more particularly at current urban issues confronting communities in Québec. We will study the physical layout of cities, urban design and urban growth, problems related to the environment, governmental institutions, as well as historical, social and cultural factors specific to Quebec cities. Students will write a paper on a topic related to urban issues encountered in Québec. The course introduces the logic of comparative research in the social sciences and applies its theory and methodology to the study of Québec cities, as compared to US cities. Its multidisciplinary and comparative character develops the ability to interpret and understand urban changes, changing demographics and to analyze appropriate and sustainable strategies and policies to address urban problems in Québec and the US. Students will gain a better understanding of economic, political, social, and cultural differences between Québec and the US. The course will also help them better understand the diversity of the contemporary urban world in Québec and the US and the importance of the social-cultural factors specific to each region and city, in finding solutions to common urban problems. By the end of the course, students are expected to be conversant in cross-border urban issues in Québec and the US. Requirements: Students are expected to keep a daily journal on the things they have seen and learned. In addition, a term paper is required that focuses on some aspect of comparison with a subject with the United States. The 6 credit term paper would be a longer version of the 3 credit paper. The topic should be discussed with the instructors. 14hr30 Walking Tour of Mile-End/Mile-Ex: Antoine Cantin, University of Quebec in Montreal. Professor Mario Carrier, Laval University. Students from all Departments are welcome. There are two upcoming Information Meetings April 8th and April 9th, 2019. See attached poster and below. Explore the cultural landscapes of Italy by creating a garden for children in Perugia and tracing landscapes of water, infrastructure and urbanism in Rome. This program is open to students from all disciplines! The program will be based in Perugia for the first half of the quarter and Rome for the second half. It will include field trips to Florence, Sienna, Naples and villa gardens in Perugia and Rome regions. Apply to International Business Program! Are you interested in combining your interest in business with foreign language and study abroad? Apply to the undergraduate Certificate of International Studies in Business (CISB) program at the Foster School of Business! Priority applications are due on Friday, April 5, 2019 for fall 2019 admission. Check out the CISB video here! See the CISB adviser for more information. Just call 206-685-3400 or write to cisb@uw.edu to schedule an appointment. Comments Off on Apply to International Business Program! Imagine experiencing Paris in Autumn (2019) on a faculty-led program with two exceptional faculty: Professor Gary Handwerk and Professor Mikkel Borch-Jacobsen! If you are interested in this program but have questions, please email us (contact engladv or the professors-emails below). The extended program deadline is April 15th, so there is time to apply! 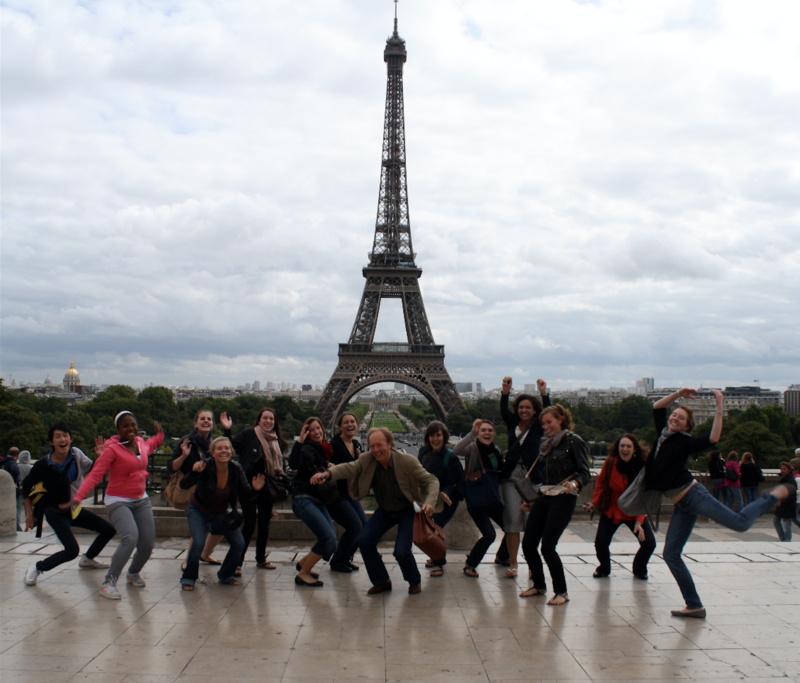 The application deadline for the Comparative Literature Study Abroad Program in Paris (October 6 to December 7, 2019) has been extended to April 15, 2019. This interdisciplinary program offers students a unique opportunity to earn 15 UW credits while living and studying in one of the most vibrant and beautiful cities in the world. The program is open to all UW and non-UW students with an interest in the humanities and arts. There are no language requirements. The program fee is $6,950. This includes tuition (waived), housing and board. Questions? Contact Gary Handwerk at handwerk or Mikkel Borch-Jacobsen at mbj. Also attached is the program brochure. Explore the cultural landscapes of Italy by creating a garden for children in Perugia and tracing landscapes of water, infrastructure, and urbanism in Rome. This program is open to students from all disciplines! The program will be based in Perugia for the first half of the quarter and Rome for the second half, and will include field trips to Florence, Sienna, Naples, and villa gardens in the Perugia and Rome regions. A quick reminder that the application deadline for this unique CIEE study abroad program is today! I talked to CIEE this morning and they have received over 150 applications from UW alone. ESS credits may be the most appropriate here. The GREEN Program is honored to announce a scholarship opportunity in honor of a very bright & influential woman in STEM, Kate Slattery: Shine On. 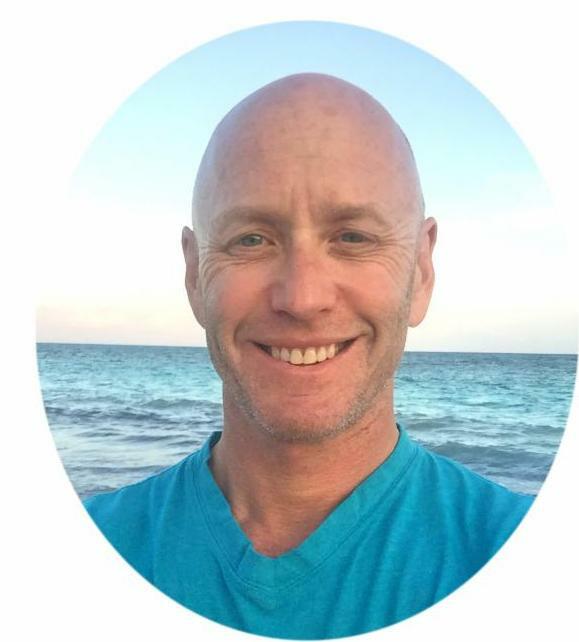 Slattery, an accomplished engineer & photovoltaic designer of SolarCity, is a published author of a children’s book, Fly with Maya, a story about a young girl who traveled the world by way of hot air balloon, learning from engineers throughout her journey. The story is meant to inspire young girls to pursue engineering careers and follow their dreams even when faced with challenging obstacles. On behalf of SolarCity and Give Power, The GREEN Program is excited and humbled to announce that two scholarships of $2000 USD each will be awarded to two women in technical fields to join us in Nepal for our Microgrid Systems For Rural Development program this December 12-21. *Please note that this is a need-based scholarship. In order to be considered for this scholarship, you must be a female in a technical field who is also an accepted student of our Nepal Program. My name is Sophia Watkins and I founded Forest Fund. We will be running a summer course in applied sustainability entrepreneurship, bringing students to the deforestation forefront to understand the economics of destruction firsthand. They will learn about sustainability problems and analyze the local and international markets that have generated them (lots of externalities!). By the end of the six weeks they will have formed small teams, picked a sustainability problem, and written and pitched a business plan for a startup to address the problem. Attached is the flyer for the summer course and here is a link to an interview by The Office of Sustainability at Harvard (https://green.harvard.edu/news/understanding-economics-deforestation-amazon). Foster Exploration Seminars (during Early Fall Start 2019) to Ghana and India are still accepting applications! 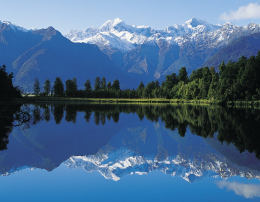 Learn about the business and society of these countries through company and cultural visits. Apps due by March 17th. No Prerequisites – All Students Welcome! March 18th is the revised deadline for applying for the Early Fall in London program. See the attached flyer for A little bit about the program. Iceland is a top destination for awe-inspiring adventure travel and eco-tourism. Home to jaw-dropping natural landscapes & pristine topography as well as authentic Nordic culture & welcoming atmosphere, Iceland is the destination for experiential sustainability education, bucket list adventuring, and unique cultural immersion. Introducing our NEW program in America’s last frontierAlaska – Species Adaptation and Climate Change! This program is designed to inspire practical solutions that promote conservation of Alaska’s ecosystems for generations to come. · Identifying key species in Denali National Park and Denali State Park, such as grizzly bears, moose, caribou, wolves and the iconic Dall sheep! · Studying the abundance of life that calls the Kenai peninsula home, including sea otters, a variety of whale species, specialized sea birds, porcupines and more. 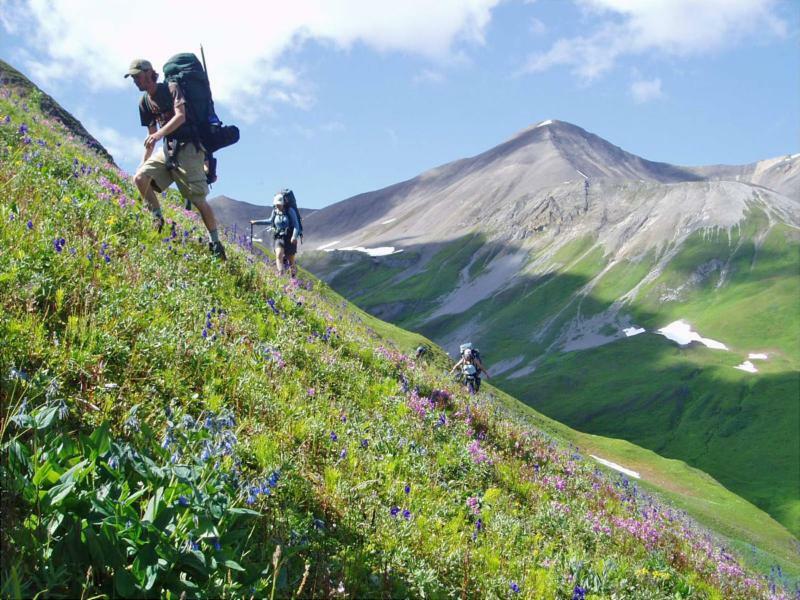 · Backpacking the Wrangell Mountains to understand local ecosystem dynamics. · Discovering the unique traditions of the Native Alaskans. Grand Challenges Impact Lab Study Abroad Winter 2020 in India! Grand Challenges Impact Lab study abroad program is recruiting students! Interested in a study abroad program that offers hands-on, project-based learning about Grand Challenges and social innovation that will also build your resume? Grand Challenges Impact Lab (GCIL), a UW study abroad program in Bangalore, India, is recruiting students for their Winter 2020 program! Grand Challenges (GCs) are the big problems facing humanity – things like food security, clean water, climate change, low-income housing, education in disadvantaged communities, and access to health care. GCIL empowers students to address GCs. Through GCIL, interdisciplinary teams of 4-5 students are placed in a local organization with experience with a GC and are challenged to propose, test, and prototype solutions using tools of entrepreneurship and social innovation. Read about past team projects and watch video summaries here: https://www.gcil.uw.edu/projects. GCIL is open to junior and senior undergraduate students and graduate students from any discipline. We are excited to help you create solutions that can make a difference and hope you will consider applying! All information sessions will be held in Wilcox Hall room 264. Sign up for our interest email list to receive notifications about upcoming information sessions and application deadlines. Follow us on Instagram or Twitter, or read blog posts from UW students currently in Bangalore to learn more about student experiences! Applications will open at the beginning of Spring quarter with a priority application deadline of May 15th. Applications will be available here. GCIL study abroad includes a 1cr Autumn-quarter course at UW Seattle, and a 15cr Winter-quarter course (approximately January 3, 2020 – March 15, 2020) in Bangalore, India. tl;dr – Grand Challenges Impact Lab is a hands-on, project-based study abroad program in Bangalore, India during Winter quarter; come to a information session to learn more and sign up for notifications here! Comments Off on Grand Challenges Impact Lab Study Abroad Winter 2020 in India! The Foster School of Business has two exciting Early Fall Start Exploration Seminars still accepting applications. 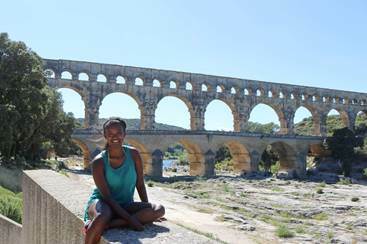 These study abroad programs are open to all UW undergraduate students, with no business knowledge or background required. The application deadline is March 3rd. Please share with interested students! Application deadline now March 3 for Argentina, Viet Nam, India, New Zealand, and Romania! The application deadlines for CHID Argentina, CHID Viet Nam, CHID India, CHID New Zealand/Aotearoa, and CHID Romania, Moldova, & Ukraine are now all March 3rd! Comments Off on Application deadline now March 3 for Argentina, Viet Nam, India, New Zealand, and Romania! Please see attached poster and itinerary about the Study Abroad Program in Quebec City, Montreal and Ottawa, June 16 – 23, 2019, for 3-5 credits. L ARCH 495A/URBDP 498C/598C. Credits can count as I&S; count towards Minors in Urban Design & Planning and Urban Ecological Design. SRAS is pleased to highlight two unique programs we are very excited to be offering in Eurasia this summer. We hope that you will share this information with your colleagues and students. In the northwest corner of Georgia lies the fascinating region of Svaneti, where the surrounding mountains have helped to protect and preserve the region’s distinct language and culture over the centuries. Under the Soviet Union, Svaneti faced many environmental, economic, and demographic pressures that had lasting effects, as did the chaos of the post-Soviet period. More recently, Svaneti has been the focus of government efforts to develop tourism and large-scale hydropower projects. This course examines questions surrounding economic development, the current environmental and social issues facing the region, and efforts to preserve Svaneti’s unique natural and cultural heritage. You will spend half the course working with the Transcaucasian Trail project, an effort to build trail infrastructure that benefits local communities and trail users through the development of sustainable tourism. While with the project, you will live and work in the mountains, designing and building the trail and engaging with local communities, learning first-hand what it takes to implement a sustainable development project and gaining insight into the practical implications the project has for the people who live along the trail. The Caucasus mountains are a spectacular setting and our living laboratory as we use the lenses of political ecology, human geography, and critical development studies to engage with some of the most pressing issues facing our planet. This NGO internship is hosted at Tbilisi’s Impact Hub where you can engage in mapping/GIS related projects, collection of interviews with the people in Svaneti, multimedia/website content production, and sustainable economic environment/tourism. This unique, hands-on learning experience is based in Irkutsk, near the majestic Lake Baikal. The program explores Russia’s vast and unique ecosystems and the challenges they face today. Students will focus on Siberia’s history from its first colonization, to its Soviet industrialization, to its current transition to a market economy. Students also critically consider Russian policies in environmental management and mitigation. Study environmental history and policy. Visit sites of environmental and cultural significance at and around Lake Baikal. Contribute to sustainable tourism by working with the Great Baikal Trail group to build and maintain a section of trail. Participate with the biology students of Irkutsk State University at their base camp on Lake Baikal as they engage in field studies. Learn how Russians interact with nature – their views as inhabitants of the largest country on earth, nature-based traditions and beliefs of the Buryat ethnic group, trends in environmental activism, and more. Learn “survival Russian” or professional language (more advanced students of Russian). This program is conducted in English and does not require prior knowledge of Russian. It is eligible for six US semester credits total. Students may extend their time in Irkutsk with additional weeks of Russian language study. Includes: Tuition, dormitory accommodation, insurance, Russian visa, airport transfers, extensive site visits/excursions/cultural events in the Irkutsk and Lake Baikal area and a transcript for the program. 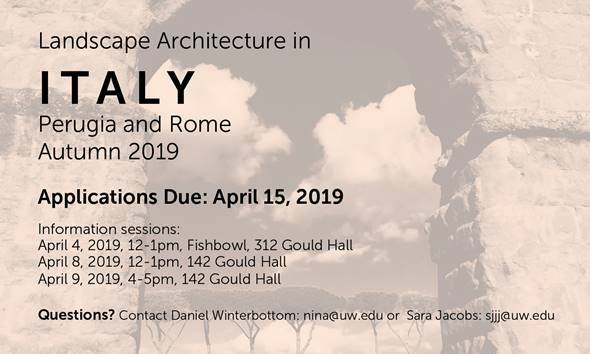 In its second year after an incredibly successful first year, the Education Rome 2019 Exploration Seminar is in its second year and still accepting applications with a priority deadline of Friday, February 15th. A 3-week program based at the UW Rome Center (right in the heart of the Italian capital) that explores the impact of historical and contemporary concepts of gender and multiculturalism on educational pipelines and life trajectory in both the U.S. and Italy. As an interdisciplinary program, there is a keen interest in admitting students from a wide range of majors/disciplines. Attached is a PDF flyer with basic descriptive information. Additionally, If interested, the application and more detailed information can be found at this link. I hope finds you all keeping warm amidst the unusual Seattle snow flurries and let me know if you have questions. 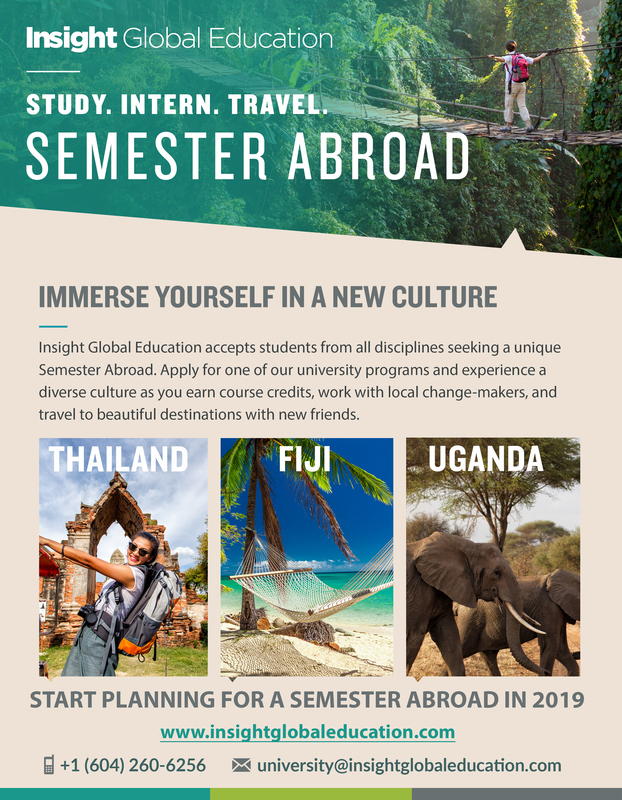 Insight Global Education is a Canadian based education organization that delivers the Semester in Development program, a globally-accredited study and internship abroad experience available to undergraduate students. They are currently accepting applications for upcoming terms. In partnership with universities and community-based organizations, the Semester in Development gives current students the opportunity to both study and intern at the same time, while gaining invaluable experience living in a developing country. The Semester in Development program runs during all three terms (winter/spring, summer and fall) and has been steadily growing since its inception in 2013. As a mission-driven organization, we believe that, by engaging with global issues first-hand, students will be better equipped to create sustainable and meaningful change. We are not advocates nor supporters of volunteer tourism; rather our programs are rooted in an ethical model of local engagement. The Semester in Development, in partnership with Makerere University and Fiji National University, currently runs in Uganda and Fiji, and will begin later in 2019 in Thailand as well. Qualifying students from University of Washington could be eligible to participate. All students who have successfully completed the program have received transfer credits at their home institution. Further details on the program can be found here. Where your education comes to life! Hello again. Ecosystem Field Studies is pleased to announce another summer-break section of Caribbean Ecosystem Field Studies and Colorado Ecosystem Field Studies and that we are now accepting applications. Can you please help us by distributing the EcoFS 2019 Course Announcement (pdf), or the below copy/paste message, to undergraduate students in your department? Feel free to forward this email as well. Thank you for considering to make this safe & rewarding field opportunity available to your undergrads. This is our 12th year of programming to over 600 satisfied students and we hope to serve some of yours. Please email me with any questions. while immersed in a spectacular & transformative educational setting! learning experience of a lifetime!